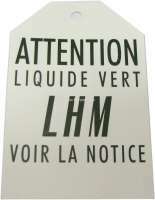 sample image Appendix card "Attention LHM". sample image Label "LHM". Dimension: 28 x 50mm. 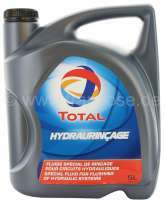 sample image Brake fluid DOT4. 1 liter. Manufacturer ATE. Suitable for all Citroen 2CV to year of construction 1981 (vehicles with drum brake in front). Citroen 11CV, HY. All Peugeot and Renault models. sample image Brake fluid DOT4. 1/2 liter. Manufacturer TOTAL. Suitable for all Citroen 2CV to year of construction 1981 (vehicles with drum brake in front). Citroen 11CV, HY. All Peugeot and Renault models. 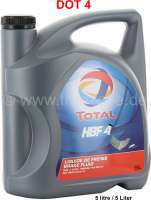 sample image Brake fluid DOT4. 5,0 liter can. Manufacturer TOTAL. Suitable for all Citroen 2CV to year of construction 1981 (vehicles with drum brake in front). Citroen 11CV, HY. All Peugeot and Renault models. sample image LHM original! No LHM +! Manufactured by Pentosin. Filled in 2 liter cans, for example, in the original holders fit at Citroen DS! Pentosin was once the manufacturer of the LHM. The LHM is exclusively for "Der Franzose". The box corresponds to the old dimensions and is made of metal! sample image LHM+ green, hydraulic fluid. 1 liter. 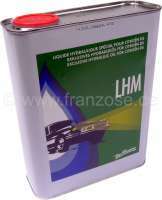 Suitable for Citroen 2CV starting from year of construction 1981 as brake fluid (vehicles with disc brake). Citroen DS starting from year of construction 1967, Citroen CX, GS, etc. for hydraulics. sample image LHM+ green, hydraulic fluid. 20 liter can. Original TOTAL. Suitable for Citroen 2CV starting from year of construction 1981 as brake fluid (vehicles with disc brake). Citroen DS starting from year of construction 1967, Citroen CX, GS, etc. for hydraulics. Liter price = 5.95 euros. sample image LHM+ green, hydraulic fluid. 5 liter can. 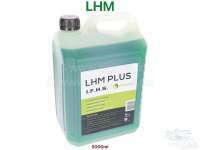 Suitable for Citroen 2CV starting from year of construction 1981 as brake fluid (vehicles with disc brake). Citroen DS starting from year of construction 1967, Citroen CX, GS, etc. for hydraulics. Reproduction. Liter price = 5.99 euros. sample image Cleaning liquid, for the LHM hydraulic system. 5 liter can. (Hydroclean) to cleaning the hydraulic system, also for Citroen 2CV, with brake system LHM. Liter price = 7.54 Euro. availability of products are expressively reserved.